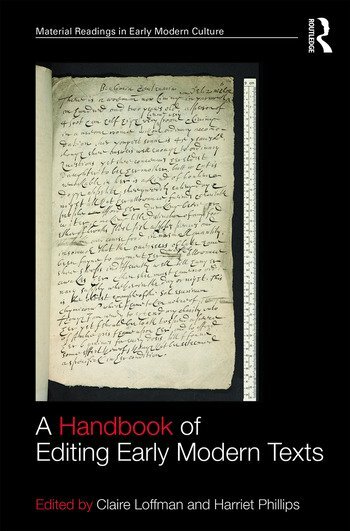 A Handbook of Editing Early Modern Texts provides a series of answers written by more than forty editors of diverse texts addressing the 'how-to's' of completing an excellent scholarly edition. The Handbook is primarily a practical guide rather than a theoretical forum; it airs common problems and offers a number of solutions to help a range of interested readers, from the lone editor of an unedited document, through to the established academic planning a team-enterprise, multi-volume re-editing of a canonical author. Explicitly, this Handbook does not aim to produce a linear treatise telling its readers how they 'should' edit. Instead, it provides them with a thematically ordered collection of insights drawn from the practical experiences of a symposium of editors. Many implicit areas of consensus on good practice in editing are recorded here, but there are also areas of legitimate disagreement to be charted. The Handbook draws together a diverse range of first person narratives detailing the approaches taken by different editors, with their accompanying rationales, and evaluations of the benefits and problems of their chosen methods. The collection's aim is to help readers to read modern editions more sensitively, and to make better-informed decisions in their own editorial projects. Claire Loffman and Harriet Phillips both worked as Research Assistants on The Complete Works of Thomas Browne, based at Queen Mary University of London, UK.